Much of content marketing focuses on brand and audience building. But when you’re building an audience you need a content infrastructure around which it can gather. Here at DVO, we have an in-house development team who work with our clients to create the best platform for the content their audience is going to engage with. Above is a perfect example of a content infrastructure we’re very proud of. The website we built for Wimbledon Studios allows visitors to see all aspects of its business: the sets, the catering, its capacity for events and more. The blog also gives Wimbledon the opportunity to engage with potential location managers, event organisers, and other professionals who want to know what Wimbledon Studios offers that other facilities don’t. Without this platform, the content we create for Wimbledon would struggle to be seen. Most of the content created off-site directs traffic back toward the website and that’s why building a solid infrastructure is so key. Writing excellent copy for Wimbledon Studios’ website and for other sites wouldn’t work effectively if there wasn’t a central hub for the audience to come to. We’ve written before about DVO’s work with Books About Town, the partnership between the National Literacy Trust and Wild In Art designed to encourage reading for enjoyment. 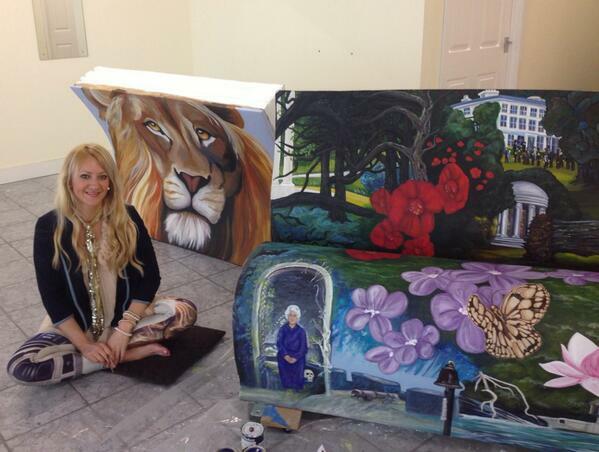 Their BookBenches celebrating stories linked to London are soon to be unveiled for the summer. To mark this launch we’ve created a platform that encourages exploration and sends readers on their own BookBench finding adventure. Books About Town has truly great content to share. The process of painting and placing new BookBenches provides important opportunities for pictures, tweets, and lively discussion. Below you’ll see our own contribution to this collection of excitingly decorated street furniture. There are lively interactions on Twitter between us, the artist Mandii Pope, Books about Town, the National Literacy Trust and others in the location where our BookBench will be placed. All of this is directed back to the content infrastructure of the Books About Town website. Without that infrastructure the readers interested in this story have no place to go. If you need an infrastructure for your audience to live in from this content marketing agency, we can help. Call us on 020 3771 2461, drop us a line at iminterested@dvoagency.co.uk or tweet us. We’re @DVOagency.